Contributor(s): Christopher E. Walker, THL Staff. Unicode Tibetan will work correctly in versions of Windows 2000 and XP only if certain conditions are met. 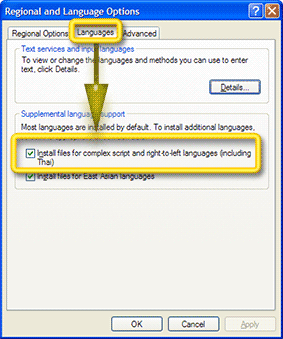 The newer version of Windows Vista is already made to support Unicode Tibetan, and none of the steps below are necessary for Vista users. For Windows 2000 and XP users, you need to have a Unicode Tibetan font installed. Second, you should have a Tibetan keyboard method installed if you plan to type Unicode Tibetan. Finally and most importantly, you need to make sure that all applications in Windows can potentially make use of a recent version of “Uniscribe,” a built-in Windows resource that renders letters on your computer screen. This section describes how to make sure this last condition can be met. IMPORTANT: You may need to have a Windows 2000 or XP installation disc to complete the final step in this procedure. Any Windows installation disc that matches your current operating system will work (that is, you don't need to have your exact, original install disc). side note: Why does the computer consider Tibetan a 'complex script'? Computers were originally designed to display characters one-by-one, in block fashion, going from left to right. Given that this system is quite inadequate for many of the world's languages, computers had to be retaught. Tibetan is quite hairy for the computer to deal with, as characters have to be positioned both up and down. The position and order of Tibetan vertical stacks is hardly something the computer can do intuitively! Luckily, so-called "smart fonts" based on Unicode have been developed to deal with the complexities of a script like Tibetan. The above graphics are taken from screenshots, which don't show you if your current computer is already updated with a suitable version of Uniscribe. If you have Windows 2000 or XP, you probably need to complete all the steps below. You may want to see how your web browser currently displays Unicode Tibetan. If your web browser already displays the longer stacks of Tibetan Machine Uni without problem, your computer may already have a suitable Uniscribe installed for all your applications. If you find that Unicode Tibetan is stacking well in some programs, but not others (for example, works fine in Word 2003, but not in the Firefox), this means you need to tell Windows to make the newer Uniscribe available to all your applications. Microsoft Office 2003, which includes Word 2003, Excel 2003, and other Office applications; comes with a recent version of Uniscribe. If you have Office 2003 with the latest service pack installed, then you already have the needed file on your computer and you can move ahead and jump to the next paragraph. Otherwise, you will either need to install MS Office 2003; install Microsoft's free Word Viewer 2003; or obtain a newer version of Uniscribe from the “Microsoft Volt Users Community supplemental files” webpage. You can also get an earlier version of Uniscribe which reportedly has Tibetan script support by installing Google Earth for Windows 2000/XP on your computer. NOTE: The utility program does not offer a version of Uniscribe by itself, as only Microsoft has right to distribute this file. Instead, the utility simply looks in your computer to see if you already have Office 2003 or Word Viewer, and if you do, it will make use of that Tibetan-friendly Uniscribe already in your computer. In basic terms, the ulitity will take the Tibetan rendering power of Office 2003 and make it work in other Unicode enabled programs. But, if you don't have the updated Uniscribe of Office 2003 or Word Viewer, then the rest of procedures below will not benefit you! For people already familiar with uncompressing zip files, you can skip to the section on running the utility. 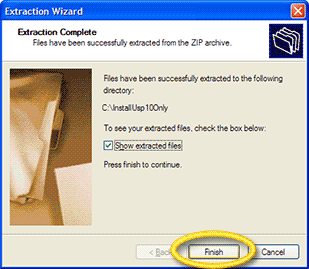 The next few steps describe how to uncompress the zip file. Choose the Open option. A window will open up showing that the file has been downloaded to your computer. You should choose a location on your computer where you can find the file later. (Once you are done with all the steps in this section you can delete both the zipped and uncompressed files.) Above, you can see that a convenient location on the C: drive has been chosen, but you can place the file anywhere. After you have verified the folder location, press Next. The computer proceeds to uncompress the zip file, then asks you if you would like to go directly to the new file you have created. If the checkmark next to the option Show extracted files is visible, you can click Finish to find the uncompressed file. Double-click on the file InstallUsp10Only.exe to execute the file. The application asks you where to find the newer version of Uniscribe which was included in Office 2003 or Word Viewer when you installed it. Most people will have the Uniscribe file in the default location predicted by small utility. If you are unsure, or want to specify the folder location yourself, press Browse. 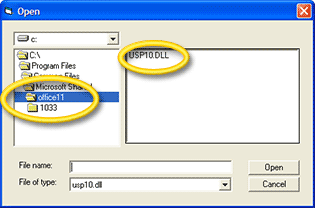 If you pressed Browse you can directly select the folder which contains the file named usp10.dll This is the proper file name of Uniscribe. If usp10.dll shows up in the upper right corner of the dialog box, you have located Uniscribe and can press Open. Press Yes to keep the newer version of Microsoft Uniscribe. 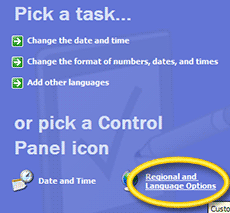 The Utility may then tell you that you need to go to the Control Panel to update your regional and language settings. 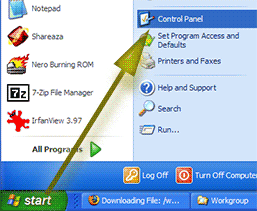 To do this, go to the Start button of your Windows machine, and go to Control Panel. Once there, click on Date, Time, Language, and Regional Options. Click OK. You may be asked for your Windows install disc. If you're lucky, Windows will already find the necessary files within its cache, and never ask youfor the install disc. If you're not so lucky, you should dutifully obey and offer up your install disc so Windows can update itself (as demonstrated in the below screenshot). NOTE: If you really can't find an install disc, don't panic. This last step of adding support for 'complex scripts' within Windows will just help programs like Word 2003 handle Unicode Tibetan a bit better (at least in theory!) You can cancel out of this last step and leave the box "Install files for complex script" unchecked. 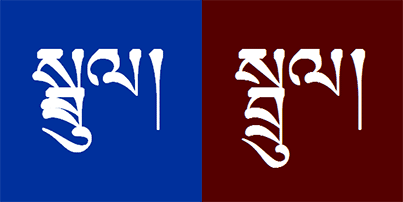 You should be able view Unicode Tibetan correctly in any case. You can go back to this option later if and when you find the install disc. Whether Windows found the files automatically or whether you supplied them in the form of the install disc, Windows will subsequently display a progress bar indicating that the update is being made. Let it finish and prompt you when the process is over. Windows will inform you that it needs to be rebooted. Save and close any other documents which may be open and click Yes to restart. IMPORTANT: Windows will not use the new Uniscribe resource until the system restarts. You're now ready to enjoy Unicode Tibetan as it should be seen! If you have installed Tibetan Machine Uni and the newer Uniscribe correctly, the box to the bottom should reveal Tibetan characters stacked correctly. Make sure you have rebooted the computer before verifying whether the newer Uniscribe was installed or not. In computer terms, a writing system is termed a complex script if rendering the letters on the computer screen involves a complex set of substitution and positioning rules based on where the letter or ligature appears in context. Tibetan, Khmer, and Monogolian are examples of complex scripts. A particular sort of lettering (on the screen or on paper). Arial is a font. Times New Roman is another. A layer of mapping between the keyboard keys (or combination of keys) that the user types and the text data that is passed to the application. An industry standard designed to allow text and symbols from all of the writing systems of the world to be consistently represented and manipulated by computers. A set of services From Microsoft for rendering Unicode-encoded text. 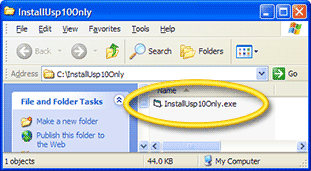 These services are implemented in the DLL library called usp10.dll. 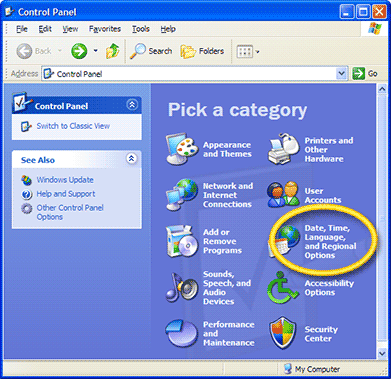 Vista is the next PC operating system from Microsoft following Windows XP. As of this writing (July 2006), Vista was due to be released in February of 2007. The Microsoft Volt User's Community provides a forum for developers to try out and discuss the Microsoft software tools related to Opentype typography, specifically the free application called VOLT (Visual Open Type Layout Tool). A download page of Volt resources can be found at: http://groups.msn.com/MicrosoftVOLTuserscommunity/homepage.msnw?pgmarket=en-us. As of July 2006, the top link on that download page offered a self-extracting file which installed Volt version 1.2 and related files on an end-user's computer. The extra files include a version of Uniscribe (usp10.dll) suitable for Unicode Tibetan. It is perfectly acceptable to grab this Uniscribe file instead of relying on the one within Office 2003. In fact, the version of Uniscribe bundled with Volt 1.2 is more recent and therefore may contain support for more scripts than the one in Office 2003, though either version will work fine for Tibetan script.